There’s no upside to attacking a dead man, but Trump can’t help himself against John McCain…. 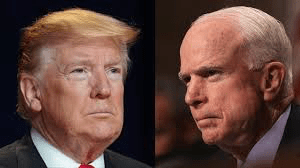 Donald J.Trump STILL doesn’t like John McCain…. John McCain passed away 6 months ago…. It doesn’t matter for Trump…. Picking on a dead man seems like the ultimate bully move. That hasn’t stopped Trump from treating him like a foil in an ongoing celebrity feud….